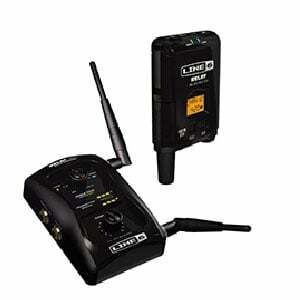 The Relay G50 from Line 6 is a serious piece of equipment worthy of professionals, an item fully on par with wireless systems used by some of the biggest music acts in the world today. We are looking at a compander-free device that’s very reliable, sturdy and effective. We took it out for a little test run, make sure to check out our findings in the full review below. The device offers a strong 200-foot range, that you can actually stretch out to the limit without causing major deterioration in signal quality. A very important feature here is that the device is compander-free. This means that the device causes zero compression or sound interference – which is actually present when you’re using standard cables, making the sound quality superior to cabled approach. Additionally, this is a full-on modern digital wireless system, featuring a 10 Hz – 20 kHz frequency response and a 2.4 GHz band. The device operates on same frequencies as a standard Wi-Fi router, making it exceptionally reliable and not prone to sound interference at all. Some of the crucial factors that make the device so reliable are presence of multiple layers of signal protection, along with encrypted data streaming, and simultaneous broadcasts on multiple channels. The package includes a transmitter, a receiver, as well as all necessary accessories including power supply, locking cable, and batteries. Although the device is packed with plenty of advanced features, most of them aren’t controllable and simply operate as long as the device is on. The controls that are present mostly refer to choosing channels to transmit your signal through. Additionally, for all you fans of cable sound, the manufacturer also added an option to adjust the product’s EQ to create a sonic environment that recreates the sound of a cabled guitar. Although it might sound silly to choose a more compressed sound of lower quality, this actually makes a lot of sense for seasoned players who have spent years honing their skills and crafting their sound through cable connection, and simply want that same vibe but without the actual cables. Typically, wireless systems don’t operate as good when their receivers are on the limit of their range as they do close to the transmitter, but this fella rocks just as fine when two inches away and when on the very limit of those 200 feet. This makes Line 6 Relay G50 our instant recommendation for players who play big stages and move around the stage a lot. And it’s not just because of the range, but also due to digital signal being pretty much immune to any usual objects being in the way of the signal path, whether it’s amps, instruments or your bandmates. As long as there’s no titanium walls between you and the transmitter, you should be just fine! Overall, the Relay G50 has everything that makes the best guitar wireless systems. It’s compact, durable, features advanced technology and stands out as one of the most reliable items of the entire niche. If you want pro-level stuff, well, this is it! For more info about Line 6 Relay G50, click here. I have a friend who play with an old Gibson. 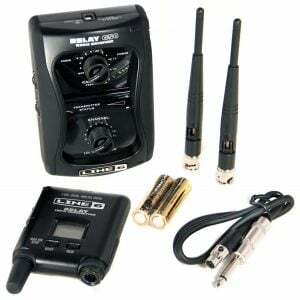 Are the sounds produced by Line 6 Relay G50 similar with the wires.